Yesterday, after a grueling morning at the doctor’s office getting my fingers pricked, I had hoped to celebrate my freedom by going out to eat at Chipotle and checking out a bakery. We went out, but I wasn’t celebrating. I just found out I have gestational diabetes. I meet with a counselor later today to determine what kinds of things I need to keep myself and my baby healthy. Ah, but a bakery, you ask? 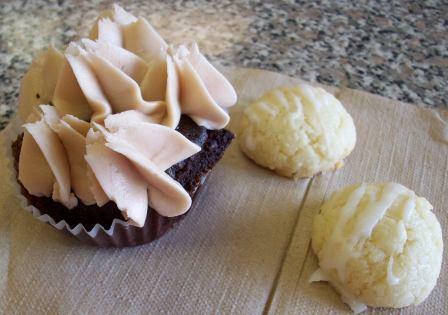 We headed to Sublime Bakery in Fort Worth to check out their gluten-free products. First thing in the morning, after all the equipment is cleaned and sanitized, the owner and chef (Catherine Ruehle) bakes some gluten-free cupcakes and cookies (and that is the only time she bakes gluten-free, to reduce the risk of cross-contact). Currently, she offers gf sugar cookies with a lemon glaze, gf vanilla cupcakes, and gf chocolate obsession cupcakes, but she is working on recipes for gf scones, muffins, coffeecakes, and snickerdoodles. She even bakes custom cakes for weddings and special events! That chocolate cupcake you see up there – it has a dark chocolate ganache filling. Oh my gosh, it was good. I only had a little bit, though (I know you’re watching me now, lol), as I shared all of that with Andy and the boys (and I took the little pieces). The cookies were also pretty good. If you live nearby, or are coming this way, you might want to call in the morning and have them set some aside for you or place an order, because once she’s started baking with the regular flours, she does no more gf baking that day. The girl behind the counter told us that some gf people will come in and buy all that they have (and I believe it – those that don’t bake at all can become quite desperate for good gf baked goods). Check them out next time you are in Fort Worth. 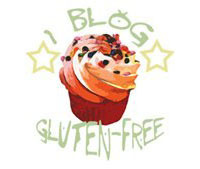 Sublime Bakery has launched an online store with nation-wide shipping, including their most popular gluten-free goodies!